The return of market volatility and the end of loose monetary policy in parts of the world has led several market commentators to suggest that absolute return funds could become more interesting if markets start to pull back. Absolute return funds are designed to provide a positive return over rolling 12-month periods in all market conditions, although this is never guaranteed. Within the open-ended funds (OEICs/unit trusts) universe, examples of absolute return funds include JPM Global Macro Opportunities (GB00B4WKYF80), Schroder UK Dynamic Absolute Return (GB00B3N53472), 7IM Real Return (GB00B75MS619), Threadneedle UK Absolute Alpha (GB00B8BX5538) and Jupiter Absolute Return (GB00B6Q84T67). Also in this peer group is BlackRock UK Absolute Alpha (GB00B5ZNQ990) which has achieved annualised returns of 2.26%, 4.47% and 1.81% on a 10, five and three-year basis respectively, according to Morningstar. Although those levels of returns are significantly less than the broader market – and other absolute return funds have produced similarly low returns – they could still appeal to a more cautious investor who wants to avoid a large capital loss in the future. BlackRock UK Absolute Alpha is co-managed by Nick Osborne and Nigel Ridge who tap into significant in-house research and support at BlackRock. He says any good fund should take advantage of their differentiated expertise. ‘Ours is a great heritage and a wonderful franchise in investing in UK equities,’ enthuses the BlackRock fund manager. He primarily puts money to work in the FTSE 100 and top end of the FTSE 250. 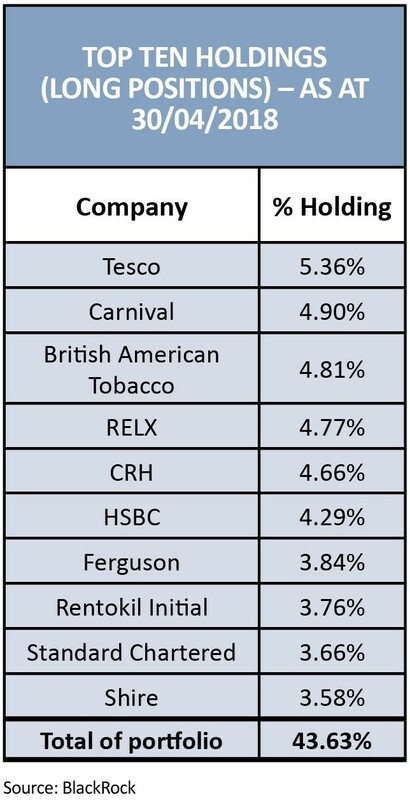 Top 10 ‘long’ positions (as at 30 April) included grocery giant Tesco (TSCO), cruise operator Carnival (CCL), media business RELX (REL) and banking behemoth HSBC (HSBA). Osborne won’t divulge current short positions and points out that shorting is often misrepresented in the media. ‘It is portrayed as speculation. Actually, what shorting always did historically, and how we use it as a tool, is to take out risk,’ he says. In falling markets, the fund manager says he is able to exercise his ability to introduce shorts to support the fund’s asset value, to take out volatility and to therefore reduce risk. Beta is a measure of a stock’s volatility compared to the overall market. Alpha is how much extra return an investor or fund manager has achieved versus a benchmark index. The BlackRock fund also uses pair trades, which you can think of as relative value trades. ‘Pair trading is an opportunity where we see two companies that have similar operating characteristics, are almost always exposed to the same sector, but we think will have different return profiles. Osborne believes the current benign global growth outlook will support company earnings, though he cautions the withdrawal of stimulus and consequences for rates will be depressive for equity markets, with valuations likely to fall from elevated levels over the next few years. Accordingly, he says: ‘We do like attractively valued cyclical shares that are likely to benefit from that growth backdrop and we can play that across a range of sectors – the UK market is incredibly international with around only 30% of the revenue exposure of the UK stock market generated domestically.